I really struggle to find a granola bar made with ingredients I am happy to eat. There are so many brands out there that on the package seem healthy, but on closer look at the ingredients they aren’t so good, often using lots of sugar, unhealthy oils like sunflower, palm, canola or rapeseed oil. 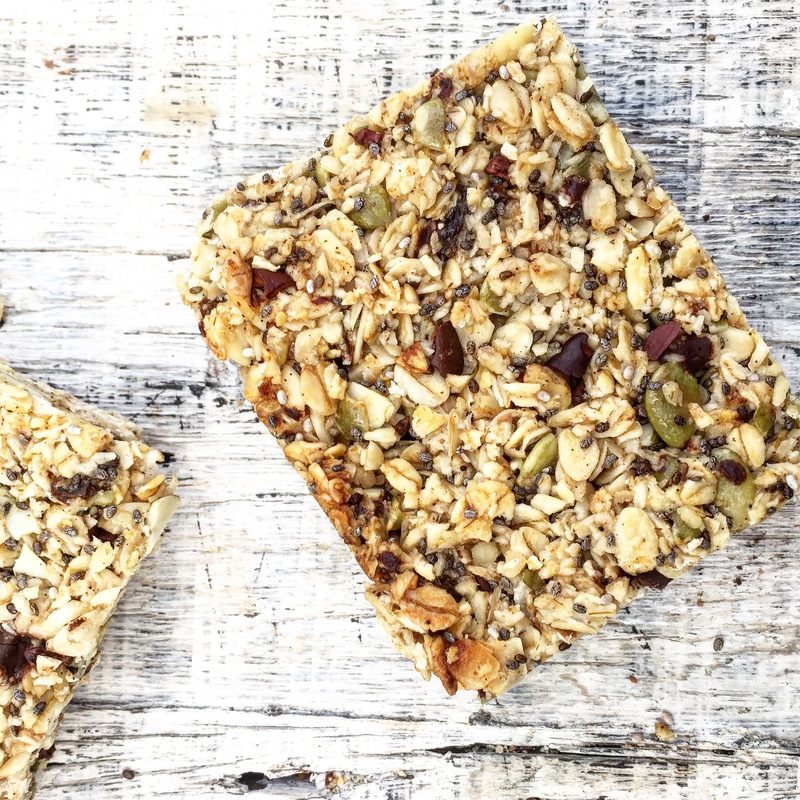 I have filled these bars with goodness and superfoods! Enjoy! Place 3 cups of oats in the blender or food processor and blend until fine to make oat flour. Transfer to a large bowl. Add to the bowl, the remaining 1 cup of whole oats that hasn't been blended, salt and chia seeds. Add the pumpkin seeds, walnuts and coconut to the blender or food processor and blend into small pieces. If you skip this step the bars won't hold together as the chunks of seeds and nuts are too big. Then add the raisins and coconut to the blender with the seeds and nuts and blend to chop the raisins up a little too. Add this mix of chopped nuts, seeds, raisins and coconut to the bowl of oats. Add the cacao nibs and dark chocolate to the bowl of oats and mix well to combine. In a small saucepan, melt the coconut oil on the stove. Stir in the honey and vanilla. Pour the coconut oil/honey mixture over the oats and stir very well to completely combine and coat the oats. If it's too dry, melt some more coconut oil and add to the mix. The hardened oil is what is going to keep these bars together. Line a small tin about 8inchesx10inches with parchment/baking paper. Pour the mixture into the tin and using your hand press it down REALLY well into the tin. Pack it in tight! If you don't have a small tin, you can use a big one and line it with parchment. Then press the mix into one corner of the tin and form a rectangle or square the best you can. Place in the over to cook for 18-20 minutes or until golden on top. Remove from oven to cool. Once cooled completely, cut into squares. The bars really need to be completely cooled if you want to cut easily, you can even put in the fridge for an hour to make easier to cut. Store in an airtight container at room temperature. These freeze well.